Enlightened despotism occurred when rulers of absolute monarchies adopted enlightenment ideas and applied them to their territories. Monarchs reasoned that they knew what was better for their subjects better than themselves. Therefore, they used goal of improving the lives of the citizens to reinforce their authority. This was seen majorly in the countries of Russia, Prussia, and Austria. Russia's monarch, Catherine II or Catherine the Great, embraced many enlightenment ideas and used them in her rule of Russia. Catherine the Great is characterized as an Enlightenment despot. She was a great patron for the arts, sciences, and education. Catherine agreed with many of the great thinkers of this era, such as Montesquieu and Voltaire. She was focused on making Russia an equal with its neighbors in its military, but also in politics, culture, and intellect. By trying to bring Russia up to date with the rest of the world intellectually, Catherine created laws influenced by the Enlightenment to justify her absolute rule. During this era, Russia's government encouraged the arts and sciences to the extent of creating the first university, library, theater, public museum, and a somewhat independent press. 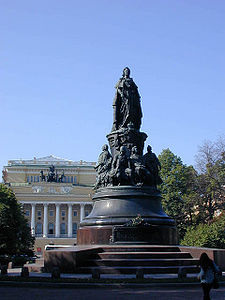 Monument of Catherine in front of Alexandrine Theater in St. Petersburg. The Enlightenment also had a major impact on the education system in Russia. 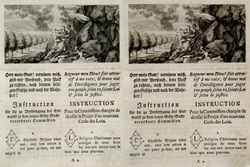 Catherine set up state-run schools that taught students in the three Rs (reading, writing, and arithmetic). These schools emphasized most of all patriotism and the acceptance of innovation. There were also Russian institutes devoted to teaching upper-class girls polite behavior and morals. Girls were educated from dance and sewing to law, mathematics and science. Catherine also set up a Sub-Commission on Education. This commission set up primary, secondary, and higher education institutes. They utilized the Prussian national education system, the English universities, and Irish schools as models to create their own schools. The education structure was formed, however, Russia did not have the finances or the teachers to fund them. Accordingly, during this time, only the towns and cities had primary schools whereas the rural areas did not. Also influenced by the Enlightenment, Catherine worked for secularization of the government. Many of Catherine's reforms influenced by this era brought about an economic change to Russia. The majority of the population was made up of a poorer class while the wealthy were the minority. Although Catherine seemed to criticize serfdom, the conditions of the serfs and peasants remained fairly constant. The peasantry was made up of serfs, church peasants, and state peasants. During this time, the wealthier upper class invested in manufacturing which was a growing industry. Just in her reign, the number of enterprises increased from 600 to about 2000. 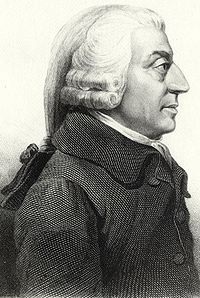 Catherine searched for a balance between the liberal economic ideas of Adam Smith and the traditional economic structure left by her predecessors. As a result, Catherine encouraged hired labor in the industry, decreased internal tariffs and custom duties, and condemned monopolies. She also prohibited buying serfs for labor.